For Goodness Sake Local Bistro cannot be held responsible for security breaches occurring on the User’s electronic device (Personal Computer or other electronic device used to browse the Website), which may result due to the lack of adequate virus protection software or spyware that the User may inadvertently have installed on his/her device. The Website servers will in such instances collect the IP address of the User computer, but not the email address or any other distinguishing information. This information is aggregated to measure the number of visits, average time spent at the Website, pages viewed, etc. For Goodness Sake uses this information to determine use of the Website, and to improve Content thereon. For Goodness Sake assumes no obligation to protect this information, and may copy, distribute or otherwise use such information without limitation. When you visit For Goodness Sake Local Bistro or send e-mails to us, you are communicating with us electronically. You consent to receive communications from us electronically. We will communicate with you by e-mail or by posting notices on this site. You agree that all agreements, notices, disclosures and other communications that we provide to you electronically satisfy any legal requirement that such communications be in writing. All content included on this site, such as text, logos, button icons, digital downloads is the property of For Goodness Sake Local Bistro or its content suppliers and protected by international copyright laws. The compilation of all content on this site is the exclusive property of For Goodness Sake Local Bistro. 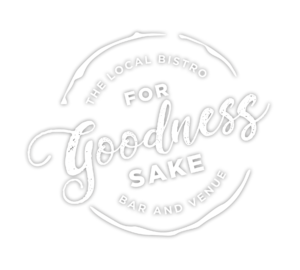 For Goodness Sake’s trademarks and trade dress may not be used in connection with any product or service that is not For Goodness Sake’s, in any manner that is likely to cause confusion among customers, or in any manner that disparages or discredits For Goodness Sake Local Bistro. For Goodness Sake and its associates attempt to be as accurate as possible. However, For Goodness Sake does not warrant that product descriptions or other content of this site is accurate, complete, reliable, current, or error-free. If a product offered by For Goodness Sake itself is not as described, your sole remedy is to return it in unused condition.